Railway transport is the most sustainable transport mode, as it consumes less energy, needs less space and produces less CO2 than any other transport mode. However, noise has long been the main environmental challenge for railway stakeholders. The public and their political representatives urge railway stakeholders to become quieter. But a lot has been achieved, and more activities are on the way. The UIC Network Noise and Vibrations (NNV) promotes effective management of railway noise and vibration in the context of sustainable development. The group forms a center of excellence; it supports transfer of knowledge, coordinates events/activities, leads research projects and facilitates communication with key stakeholders. It works in close cooperation with other railway organizations, the EU commission and national authorities. The work of the Network is based on the Environmental Strategy of UIC and CER of December 2010. The rail sector response to growing pressure from the EU, national governments, lineside inhabitants, health organizations and NGOs. Evaluation, review and guidance on upcoming new noise and vibration legislative initiatives and mitigation policy ideas and incentives (e.g. 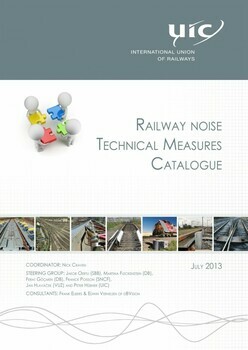 noise differentiated track access charges, prohibition of cast iron brake blocks, rail dampers etc.). In addition, it will consider the effects of noise mitigation methods on vibration and vice versa. UIC Network Noise is concerned with all aspects of railway noise, e.g. rolling noise, stationary noise, and noise from shunting yards. UIC Network Vibrations is dedicated to study vibrations and ground borne noise issues. The expert meetings of NNV are held twice in a year. The UIC Sustainable Unit working group on vibration has just published the Vibrations State-of-the-Art Report. In modern daily life, people are exposed to many types of vibration. The vibration is often accepted as obvious and no cause for concern, for example when driving a car or when taking a lift. In some cases, vibration originating from sources outside the house may be felt inside dwellings. This applies for example to heavy road traffic, trams and railway lines, both on surface lines and in tunnels. This vibration is typically observed as a gentle trembling of the house, usually of the floor people are standing on. The vibration itself can generate a rumbling sound, caused by the vibrating building radiating sound into the rooms (known as structure-borne sound). Secondary noise, i.e. rattling of loose doors, pottery, etc., can further amplify the audible noise or make it more noticeable. Whether or not the vibration can be perceived depends on many factors, including distance to the source, speed and type of the traffic, quality of the road or track, type and build-up of the ground, and the construction of the building itself. Modifications performed in the soil (modification of the sewer network, for example) or even in adjacent buildings can give rise to an increase of vibration or ground-borne noise. Contrary to popular belief, vibration caused by passing trains is far too weak to cause even cosmetic damage (when the structural integrity of the building is affected) to buildings. Nevertheless, residents affected by vibration may experience annoyance and could thus voice concern. The degree to which the vibration sensation is masked by audible noise can also play a role, as well as personal sensitivity. Railway-induced vibration was first noticed and labelled an issue in relation to underground train lines. It is only in recent times that the vibration from surface lines is getting more attention. Vibration is usually accompanied by ground-borne noise. The relative significance of these two phenomena depends mainly on the soil type. In countries with stiff soils, e.g. solid rock, ground-borne noise is generally more important than vibration, and dominant vibration frequencies are higher (i.e. around 50 Hz). In countries with soft soil such as clay or peat, vibration may be more important than ground-borne noise and dominant vibration frequencies are lower (around 5 Hz). This difference in soil type is an important factor affecting the performance and selection of mitigation measures. For railways, vibration is most often generated by the contact between the train wheel and the railway track. The vibration then travels from the track, through the ground and into the building foundation. Generally, the strength of ground vibration reduces as one moves away from the track. However, the strength of vibration may increase when moving up floors inside the building due to resonances of the building structure. There are a number of mitigation measures available that can be applied to either the track or the vehicle. Because local factors (terrain, construction of individual buildings, space etc.) have a strong influence, the effectiveness of these measures can differ greatly from case to case. The prediction of vibration levels is thus a complex process and often involves a large degree of uncertainty. In some cases, especially existing situations, the cost of mitigation may be prohibitively expensive. In assessing vibration and designing mitigation, expert judgement is required. Guidelines for acceptable levels of vibration vary from country to country. The impact on residents depends strongly on individual and local circumstances. Therefore, any values mentioned in this report should be interpreted with great care. For new situations (railway lines or residential and other property development), it may be required to assess vibration and propose mitigation measures in the environmental impact assessment. For existing situations, most countries do not have a legal obligation for railway companies to assess and mitigate vibration. However, railways take residents’ concerns seriously and, where appropriate, will support an assessment and consider mitigation measures. The present report reflects the state of the art, which is mainly based on the experience of the European rail-operating community, publications from academia and consultancy, the results of the collaborative research projects RIVAS and Cargovibes, and the work of standardisation committees, insofar as it has been published. Railway transport is the most sustainable transport mode, as it consumes less energy, needs less space and produces less CO2 than any other transport mode. However, noise has long been the main environmental challenge for railway stakeholders. The public and their political representatives urge railway stakeholders to become quieter. But a lot has been achieved, and more activities are on the way. This report describes the recent developments and their impact. 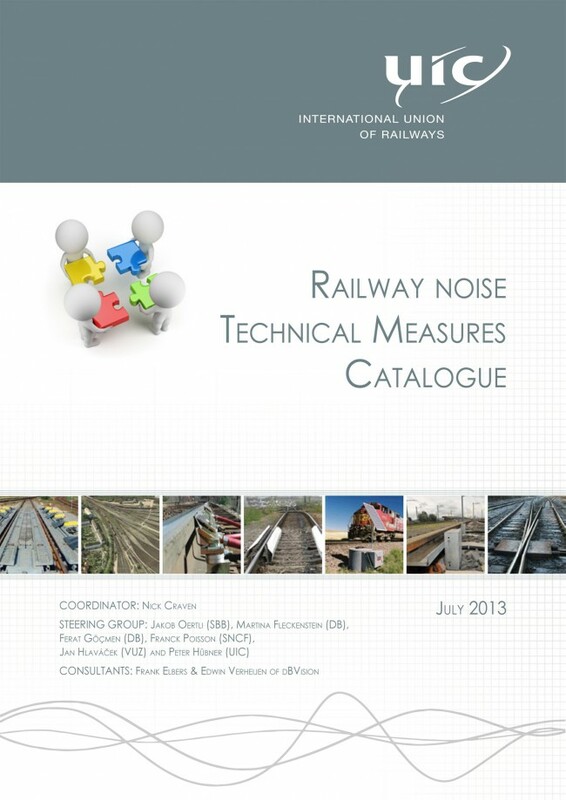 This report is an update of a previous version, entitled Railway Noise in Europe, which was published in 2010. During the past few years’ significant developments have taken place with respect to legislation and approach, approval and application of technical solutions, responsibilities of the various parties involved and ways to persuade stakeholders to engage in common enterprises to improve the noise situation. At the same time, there is greater insight into the effects of noise on exposed residents and a growing pressure on railway enterprises and infrastructure managers to reduce noise where feasible. As a consequence, a significant noise reduction has been achieved for millions of European residents. Passenger vehicles with noisy cast iron brake blocks have been phased out in large parts of Europe. The retrofitting of significant parts of the rail freight fleet with composite brake blocks has started. In addition, old noisy wagons are scrapped every year and the new wagons replacing them are much quieter. Many kilometers of noise barriers have been constructed, a large number noise insulated windows installed and measures on the track introduced. There is a growing awareness of the impact of railway noise on public health, which has resulted in pressure from line-side inhabitants, governments and health organizations for increased noise mitigation. As a consequence, noise can be a limiting factor for many railway operations, introducing additional costs for mitigation, demands for limits on availability/capacity and resistance to expansion of the network. Recent years have seen the development of new, and refinement of existing, strategies and technologies for noise management. Railway companies often face calls to implement these, and demonstrate that progress has been made with the use of new and innovative technology. By collating best practice and case studies from "real life" tests and adding the theoretical knowledge in this Catalogue, UIC stimulates the implementation of publically available knowledge, demonstrate the progress that has been made and also manage stakeholder expectations. In addition, one final chapter is dedicated to measures against rolling noise: rail and wheel dampers, K and LL blocks, noise barriers and acoustic grinding. Curve squeal Curve squeal is a highly annoying sound that is radiated by trains running through sharp curves. Much progress has been made during the past decades in understanding this phenomenon. Mitigation measures aim at avoiding squeal events or at least reducing their duration or strength. Flange lubrication and top-of-rail application of friction modifiers have demonstrated to be very effective (reduction1: 5-20 dB(A)), provided that the dosing devices receive constant and dedicated maintenance. Friction products can be applied from trackbased as well as vehicle-mounted devices and there are many manufacturers and suppliers of such devices. Special bogie designs, aiming at improved steering performance in curved as well as straight track, also reduce squeal noise and are potential solutions for the future, provided that safety issues can be solved adequately. Marshalling yards are areas where freight trains are decoupled and coupled. Because of the large scale of the yard, mitigation by noise barriers is no option. Among the most important noise sources are screeching rail brakes (retarders), peak noise from coupling vehicles and starting diesel engines, and steady noise from locomotive engines and auxiliary systems. Recently, new solutions for noisy rail brakes have been developed, showing promising noise performances (5-15 dB(A)). For stationary noise of several locomotives, technical modifications have been developed. Stationary noise of diesel engines, for example to operate cooling vents, may be avoided by using a way-side electric power supply. Switches and crossings are among the most sensitive parts of the railway system, claiming a large part of the maintenance budget. Switches and crossings also produce noise: impact noises from joints (if present) and screeching noise similar to curve squeal. In a traditional switch, a wheel encounters several gaps, causing a train to produce a rattling sound. Jointless switches are state-of-the-art nowadays (2-4 dB(A)) on lines where trains run at operational speeds. Squeal noise and flange rubbing noise in switches may receive the same treatment as squeal noise in curves (5-20 dB(A)). exceeded (1-3 dB(A)). The potential of acoustic grinding will increase if all train wheels are smooth as well. A large improvement in this field is expected from the homologation of LL braking blocks, which make retrofitting of freight vehicles a cost-effective option (8-10 dB(A)). By application of rail dampers (0-3 dB(A)) and wheel dampers (0-2 dB(A)) a further noise reduction can be achieved. Rail dampers are applied in several countries. The noise reduction depends largely on the characteristics of the track system without rail dampers. Promising developments for urban areas are low-close barriers, typically placed at only 1.70 m from the track with a height of 0.70-0.85 m. In certain cases low-close barriers are acoustically equivalent to much higher conventional barriers, their advantage being that they do not block the view. However, in view of safety issues with barriers placed that close to the traffic, to date only few countries have decided about homologation. “Within OeBB there is no such system in preparation at the moment. In fact, representatives of OeBB are just participating in international expert discussions / panels to get a view and impression about the market, legal and technical developments in this area, in the same manner as most of the other infrastructure managers”. Page 2, the statement "... At this moment, the following K blocks are temporarily permitted for use in international freight wagons: CoFren C810, Jurid 816M and Becorit 929-1SG. ..." is not correct, as the the K-blocks CoFren C810 and Jurid 816 M are fully approved (the system K is fully homologated since 2003). Following the European Environmental Noise Directive (END directive n°2002/49/EC), noise mapping have to be done for large agglomerations and important infrastructures, every five years. The year after, the noise maps have to be followed by action plans. railway lines circulating inside the agglomerations with more than 250 000 persons. The following rounds will concerned infrastructures with more than 30 000 trains by year and agglomerations with more than 100 000 persons. Noise maps are available here. Even if the national authorities are responsible for the establishment of the maps, it is important for railways to be involved in the procedure. UIC has published two documents to inform railways on this issue. In December 2009 UIC had the UIC END workshop: "The EU Directive 2002/49 (END) Challenges of the European railways - options and obligations" in Copenhagen. The question ‘What are bearable limits for environmental railway noise?’ is discussed regularly in different forums at both National and European levels. To inform this debate, UIC has commissioned dB Vision to perform a systematic evaluation of all aspects affecting what is ‘bearable’. This allows UIC to propose, for the first time, a well balanced noise limit considering the interests of lineside residents and also what is feasible for the railways. The findings are presented in a two-part report titled ‘Bearable noise limits and emission ceilings for the railways’. Please click below to download the reports. Achieving the WHO night noise guideline of 40 dB Lnight would result in high costs and a massive impact on transport and the spatial environment. The application FreightSimSilent allows all cost-relevant parameters for retrofitting to K or LL brake blocks to be easily manipulated and displayed in diagrams spanning 20 years. This helps users make sound decisions and optimise different retrofitting conditions. The software was developed for UIC by Deutsche Bahn and the IT company join and share. FreightSimSilent is available in four languages: English, French, German and a user-definable language. Noise from parked trains is an increasing problem. In response to this, UIC have commissioned Müller-BBM to complete a technical review of the issues. The increase in noise issues related to parked trains is largely a product of urbanization and modernization. In passenger transportation old fashioned composites of locomotives carrying passenger coaches are more and more being exchanged with modern multiple units that generally come with a far larger number of technical aggregates. In addition more and more yards and sidings are located in urban areas, which inevitably raises the number of people affected by noise from parked rolling stock. Nowadays, parked railway units have to be short-term ready for operation. Thus, different aggregates as heating ventilation and air conditioning (HVAC) or compressors are often in operation during the parking of the vehicle and cause noise. Especially the blow-off via the exhaust valve of the air dryer within the air supplying device is very noisy. Fluctuations due to multiple compressors running at slightly different rotational speeds can further tension the problem. The location of some of the aggregates on the roof of the vehicle makes countermeasures such as sound barriers far less effective. Particularly low floor multiple units which are popular with local and regional train services encounter this problem, as most of their aggregates generating noise on the parked train are located on the roof. The parking areas are often located in urban areas, so that the noise emission of parking vehicles leads to complaints from local residents. These complaints can lead to restrictions on railway operators, who often need to carry out essential preparation work (e.g. cleaning) and maintenance of rolling stock at night. Managing the noise from parked trains is complicated as different parties are involved like infrastructure managers, operators and fleet owners. The problem has increased for Infrastructure Managers and Rolling Stock Undertakers as some European countries have adopted national legislation to control noise from parked trains at night. The current revision of the TSI Noise includes limit values within the stationary noise section for the operation of the main air compressor (as the main intermittent noise source) and the exhaust valve of the air dryer (as the main impulsive noise source). This addresses two problems of parked rolling stock, it does not, however, cover all aspects of parked trains and it only applies for trains to be ordered in the future. Due to the complexity of the problem, a comprehensive analysis of the problem is necessary, including typical operating conditions of parked trains and the respective operating conditions of the aggregates. The presented research project compiles a number of possible strategies to manage the noise from parked trains and intends to give guidance for infrastructure managers and rolling stock operators as well as fleet owners to deal with the problem. According to the UIC/CER report ‘Noise reduction in European infrastructure’ (2007), every year, between €150 and €200 million is spent in Europe on building noise barriers and installing insulated windows, more or less meeting with acceptance from residents. Transferring a part of these founds to the retrofitting of freight wagons would provide the same reduction in noise and would save money. The European Directive on the Assessment and Management of Environmental Noise has been in force since 2002. It requests Member States to produce strategic noise maps of the major transport infrastructure and of agglomerations. The maps shall be made public and serve to assess the number of citizens in each Member States that are exposed to potentially harmful noise from roads, railways, airports and and industrial activities. is excessive and protect areas where the noise quality is good. The public shall be consulted with respect to these Action Plans. The European Commission has reviewed the implementation of the Directive in 2010 and has proposed some improvements. In 2012, a public consultation was launched on the contents of this proposal. The railway sector responds to this consultation, among others, through the current report. It is in the interest of the railway sector in Europe to create a level playing field with all other transport modes. To that effect, the railways strive for an internalization of external cost. Moreover, the railways wish to maintain and reinforce their image of environmental friendliness and guarantee the capacity, quality and availability of the European rail infrastructure. The Directive ignores the impact of some of the transport modes, such as inland waterways,and for other stressors than noise (e.g. air quality or CO2), there is no distinct assessment of the impact of different transport modes. The noise annoyance correction factor, which indicates railway noise to be less annoying than road traffic or air traffic noise at equal noise exposure, is completely ignored. This leads to a situation where the railways’ contribution to the annoyance and health effects in Europe is largely overestimated. Furthermore, the railway sector feels that the overall results produced by the noise mapping should enhance tighter type approval limits for road vehicles, as these are the dominant noise source by far. This policy element is essential to the success of the Directive but is currently not merging. operation of railways, if they were to be based on the extremely low night time limits proposed by he World Health Organisation. There are many noise mitigation options open to railways. Some of them - such as noise barriers - have a known effect and are used widely, others such rail dampers, acoustic rail grinding or low height noise barriers are still controversial for various reasons. Since each railway has limited opportunities to extensively test these controversial measures, the Network Noise of UIC decided to collect results and measurement conditions of these three noise abatement measures. This report first de-scribes some elementals of noise control as well as quantities that are important for understanding the arguments made. It then describes the three noise mitigation methods in more detail, explains why they are controversial and finally lists and comments on the experience made to date. The experience in other countries was obtained by asking members of the UIC Network Noise as well as representatives from other European countries. The request for information was sent in mid 2011. In addition this report was sent to Network Noise members in mid 2012 for comments and for additional results not available in 2011.A limited number of results where obtained from other sources. There is a large variability in the results ranging from small increases in noise to a maximum noise reduction of usually not more than 3 dB. The effects of dampers are influenced by many parameters such as construction (rail pad stiffness) or traffic. However for many of the results these parameters were not measured. Therefore it is difficult to compare the results or to use the results from one situation in order to predict the effects in another one. Network wide cost-benefit analyses have not been undertaken to date. The ongoing Swiss project is the first to attempt this. The STARDAMP project and the ongoing Swiss trials are the first systematic approaches to the problem measuring all relevant parameters. The results of these projects still outstanding and will be included in further editions of this report. Only two countries – Germany and The Netherlands – have implemented acoustic rail grinding procedures. In Germany the procedure allows a legal noise reduction of 3 dB, while in The Netherlands specific noise reduction aims are defined. Lacking are network wide cost benefit analyses. It is suggested that these are undertaken, best in a cooperative approach by the railways. From an acoustical point of view low height barriers are comparable r to normal barriers and they have the advantage of fitting into the landscape. On the other hand, there is not yet enough ex-perience to satisfactorily address maintenance and security questions. Some countries (e.g. Norway) do not report problems, others (e.g. Switzerland) are not pursuing the issue because of these concerns. Freight trains are the main contributors to noise from mixed railway lines. The railway sector, represented by UIC, proposes the retrofitting of the existing European freight fleet, by replacing cast iron brake blocks with composite (organic or sinter metal) brake blocks. Over the past years, various scenarios have been proposed to support the sector financially to achieve this goal. Whether or not this program should be supported by public means depends on the benefit of the operation. The benefit can be expressed as the reduction of noise levels to be achieved by retrofitting. In the past decade, many field tests have been carried out, focusing on the feasibility of retrofitting and the economical and safety implications of it. Occasionally, such tests have been combined with noise measurements intended to assess the achieved reduction of noise levels. quality tracks in Europe. It turns out that, after this conversion, the results are very consistent and similar, with very few exceptions. It is emphasized here that a reduction of 7 to 10 dB(A) implies that 5 to 10 times as many trains can be operated with the same long term average noise level, i.e. within the same legal limit. In practical situations, if the real track roughness exceeds the CEN ISO 3095 values, the reduction would be less than the values shown above. For other tracks however, with lower roughness levels than the CEN ISO 3095 curve, the reduction would be similar to or even larger than the value indicated above. This would apply for instance to the “especially monitored track” (besonders überwachtes Gleis) in Germany. For a relatively good quality track, the reduction values could be typically 3 dB(A) less than indicated above. In exceptional cases with bad track quality the reduction could be negligible. National noise legislation requires rail infrastructure managers throughout Europe to take noise mitigation measures. Practically, the choice is between vehicles related measures (for example brake shoe retrofitting), track related measures (for example rail dampers), measures in the propagation path (for example noise barriers) and measures at the receiver (for example double glazing). The costs of the different measures are a crucial parameter when making this choice. passed since. Therefore, the current study was launched with the objective to review and update the information on which the STAIRRS results were based. Particularly the current study addresses the fact that cost data should be based on life cycle cost assessment rather than merely investment costs in order to have a fair comparison between options. In the frame of the current study, an attempt was made to collect practical data on cost elements such as maintenance costs and life span of certain measures. For rail freight retrofitting, such an assessment has been made in full detail, and the intention was to compare this data with similar data for the other options. In addition, information was collected on the amount of noise migration required in the different member states, based on current legislation. It was found, that very little detailed information is available from the infrastructure managers. Usually, once the noise mitigation measure has been installed, the costs for its maintenance are hardly ever earmarked and therefore are difficult to assess. Moreover, the life span of many measures is not exhausted yet, so that renewal costs data are not reliably available either. was adapted to the current best estimate (350 000 wagons instead of 710 000 wagons). The cost indicators were changed to Net Present Value instead of the indicator “Present Cost” PCx, which is not as well defined. Railways and the environment. Building on the railways' environmental strengths.